With the new command line being a toolbar that is easily drag-able, it is just a matter of time before you lose your command line by dragging it either too far down or dragging it completely off the screen. But don’t worry, you can get it back. Then under the “Properties” click the flyout next to “Orientation” and select where you want the position of the command line to be. You can also lock these item’s position through the through the LOCKUI system variable. 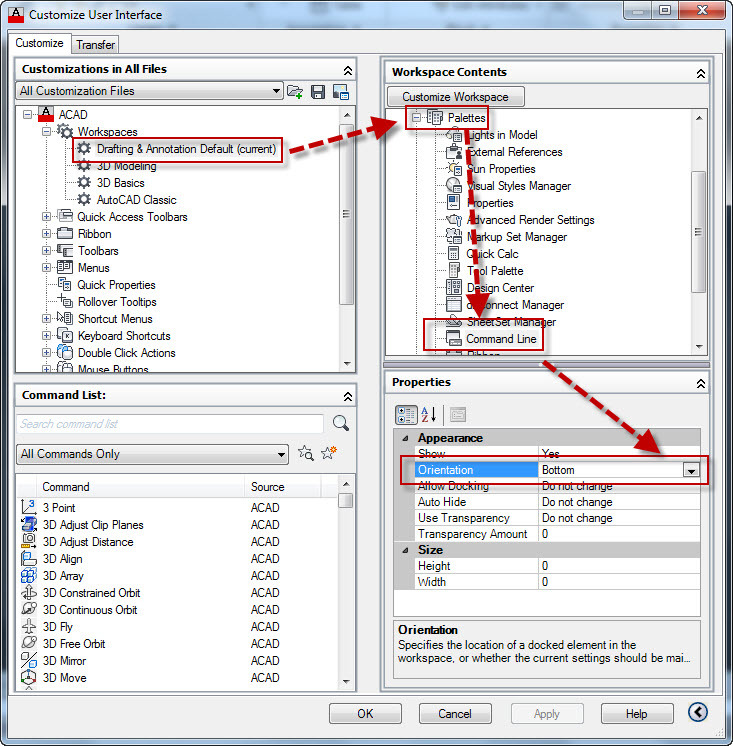 This entry was posted in AutoCAD 2013, BASICS, Customization, Manage, Settling In, TIPS. Bookmark the permalink. Oh thank you thank you for this!! My command line became really wide (not sure what caused it) so I couldn’t grab neither left nor right corners to resize it. I couldn’t see what I was typing and ctrl 9 wasn’t helping. I followed these steps and voila! It’s back! I have a problem, I used to be able to click on the “Open” tab on the top of my screen. When I did this a window would open that let me browse my files. Now all of a sudden when I click the “Open” button the command line promts me to put in the fille I want… HELP…How do I get the browse window back? I dont know how i can do a larger row in the text window. Default is 80chr. It works maybe in 99% of the cases. I can’t get back my command line! Once the command line is placed correctly, save or update your workspace. Then when you lose the command line again, switch to another workspace and then back to yours. The problem is I can’t place it correctly, it is not showing up. I imported another profile, the command line keeps hiding. On CTRL+ 9 it ask if I’m sure that I want to hide the command line… even if it is not there.